The Bank of Thailand (BOT, Thai: ธนาคารแห่งประเทศไทย) is the central bank of Thailand. The Bank of Thailand (BOT) was first set up as the Thai National Banking Bureau. The Bank of Thailand Act was promulgated on 28 April 1942 vesting upon the Bank of Thailand the responsibility for all central banking functions. The Bank of Thailand started operations on 10 December 1942. The Bank of Thailand Act, B.E.2485 was later amended in order to put emphasis on BOT’s social responsibility, to create a mechanism to guard against economic crisis, as well as to set up BOT's decision making process to ensure good governance and transparency in the organization. The Bank of Thailand Act, B.E.2551 came into force on 4 March 2008. The Bank of Thailand's mission is to provide a stable financial environment for sustainable economic growth in order to achieve continuous improvement in the standard of living of the people of Thailand. 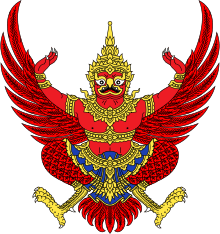 Wikimedia Commons has media related to Bank of Thailand. ↑ "List of Governors of the Bank of Thailand". Bank of Thailand (BOT). Bank of Thailand (BOT). Retrieved 1 February 2016. ↑ "Roles and Responsibilities of the Bank of Thailand". Bank of Thailand (BOT). Bank of Thailand (BOT). Retrieved 19 September 2015.